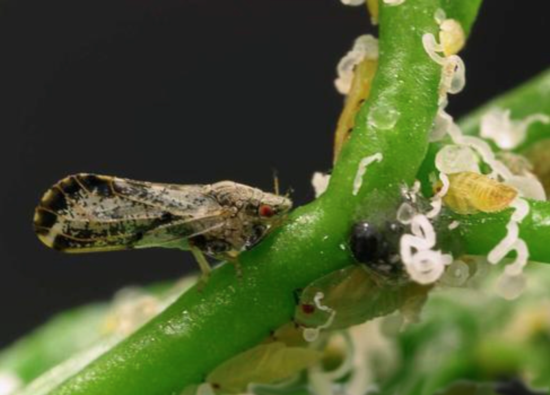 An insect that causes harm to citrus plants and trees has made its first appearance in Novato in Marin County, and the Marin County Ag Office is working with state agriculture officials on next steps. County staff is collaborating with the California Department of Food and Agriculture and the City of Novato to start a survey and treatment program in response to the November 22 detection of one Asian citrus psyllid (ACP) in the northeastern neighborhood of Novato. Originally found in Asia, these aphid-sized pests have been found in Southern California and the Bay Area in the past few years. ACPs are of concern because they introduce and spread a deadly plant disease called Huanglongbing, also known as HLB. While not harmful to humans, the disease is the most serious threat to citrus trees worldwide and has no cure. Diseased trees must be removed to protect other citrus trees nearby. Although there are no commercial citrus operations in Marin, an estimated 60 percent of California homeowners have a citrus plant on their property. Common types of citrus plants grown in Marin include oranges, lemons, limes, mandarins and grapefruit. Young ACPs are yellowish orange, produce a white waxy substance, and are usually found on new plant growth. Adult ACPs are brown and about one-eighth of an inch long, similar in size to an aphid. Juveniles, adults and eggs are typically found on tender, new leaves. Infected plants have blotchy or yellowing leaves and produce small bitter fruit. Though unappetizing, citrus fruit infected with the disease is safe to eat. Agricultural officials have placed insect detection traps throughout the area to determine if this is a singular insect or one of a larger breeding population. The traps assist with establishing the distribution of the pest. The officials plan to treat individual citrus host plants within 50 meters of the site where the insect was trapped. Residents within the treatment area will be notified in advance and community outreach meetings are being planned. To prevent further movement of ACPs in the area, the state is establishing a quarantine to regulate the movement of all citrus trees and citrus plant material. Homeowners should not move citrus trees, citrus plant parts, or foliage of citrus trees outside of the Novato area. Residents are urged keep an eye out for suspected symptoms while tending to gardens or watering. Call 800-491-1899 to report suspected symptoms. Learn more at CaliforniaCitrusThreat.org, a website administered the California Department of Food and Agriculture.